Kingsley King is the Creative Director for JUICE an LGBT event brand that targets a black/urban audience between 18– 45. Kingsley started in 2016 as the main promoter. Over the last two years he secured an array of elegant venues across central London to create the best LGBT parties in the capital and also takes pride in creating inter-generational spaces with older party goers attending. I wanted to create something less expected, a Soiree; a space where people can network and socialize over dinner as well as have a party to dance and get sweaty if they like. There wasn’t much of a variety of events on a weekly or monthly basis for the London’s Multicultural LGBT community where everyone felt safe! JUICE fills a huge gap! Ultimately, I hope to expand my brand regionally throughout the UK and in time to Europe and America hosting regular club nights branding JUICE through merchandise including clothing wear and sports apparel. My energy is focused on the Soiree Dinner and creating a fabulous experience that celebrates London’s Multicultural LGBT people. 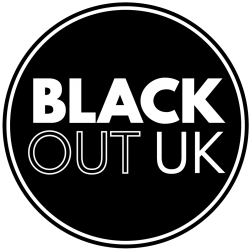 Blackout loves to promote creative hard working Black Gay Men doin it for themselves and doin it for US! We’re excited to be part of Kingley’s journey. Join Blackout as we support the entrepreneurial energy of this talented and creative visionary who is fast emerging as a King of the Scene. The evening is ticketed and includes a three-course meal accompanied by two glasses of rum punch, A Cabaret show with burlesque dancers followed by one of the biggest LGBT after party in the capital.